I have been intending to write you a thank you note for quite some time, but receiving your newsletter in the mail reminded me just how thankful I am for the wonderfully sweet kitty I adopted from your organization. 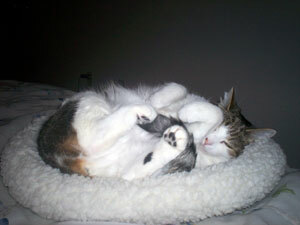 I’d like to tell you just how far my little angel has come from the time I visited the Cat House in November 2007. I arrived at the Cat House looking to adopt a male companion for my 3 year-old Norwegian Forest cat Martha. All of the cats at the house were friendly and sweet, but something just wasn’t right. I asked if you had any additional cats, and was told there were a few declawed cats in a back room, separated from the others for their safety. Martha had been previously declawed, so I was hoping there was a male cat there that would be the perfect friend for her. As soon as the door to the back room opened, I saw the kitty that was going to change my life. Inside the cage was an adult female cat, huddled with her back to the door and her face buried in her cat bed. As I approached the cage, she buried her face deeper and starting shaking. 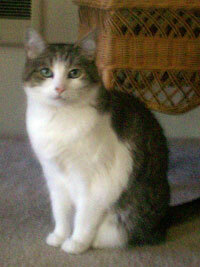 I glanced at the identification tag on the cage - ‘HEIDI, age 6, arrived at Cat House Sept. 2007'. No wonder this kitty was so sad - she’d been here in this cage for nearly 6 weeks! I asked if I could hold her, and was told she didn’t like to be held, but that I could give it a try. She clung to her cat bed for dear life as we tried to remove her from the cage. As we placed her on my lap, she immediately buried her head in my arm and shook. This little lady was way past her kitten years - she wasn’t going to want to chase toys, or greet me at the door purring, or - as I saw that day - be much of a cuddler. But what she did need was a good, loving, forever home, and I knew I could offer her that. I abandoned all my ideas of finding a male cat, and asked if I could adopt Heidi. Happily, I was told I could. Heidi has been an incredible addition to my family. I was completely wrong about her being past her kitten years; there is definitely the soul of a kitten in her 7 year-old body - she is the best feather-on-a-string hunter I’ve ever seen! Although it took her over a year, she has finally started asking if she can sit on my lap while I watch TV, and is completely unable to fall asleep at night unless some part of her body is flopped across part of mine, or until she has crawled under the blankets with me. She is flopped across my laptop keyboard, asking for her morning loves, even as I type this! Although she was initially hesitant to want to accept Martha, they have become good pals. She is still a very quiet, introspective cat, who I imagine has been through some tough times in her life. Haven’t we all? 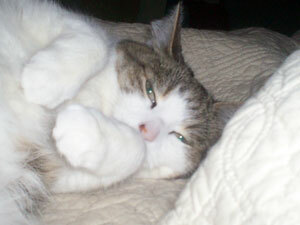 She is a wonderful example of a cat’s ability to endure and to love again. My life would be awfully empty without my feline companions, and I owe Heidi’s existence in mine to Feline Friends - if she had ended up anywhere else, she might not have been able to wait those 6 weeks for me to find her. I cannot thank you enough for giving her a second chance at life, and for the lives of all the other cats you’ve been able to save. I recommend your organization often to friends and family looking to adopt, and the next time I am looking to adopt a kitty companion, I will definitely come your way. I have attached a few photos of Heidi, to jog your memory and show you how well she is adjusting to her home. Again, thank you so much for all you do for these cats and for this community!